The X-crutch is the most advanced underarm crutch with the easy-to-use length memory function, so you don’t have to adjust it every time. Simply pull the top and bottom portion and it is ready to use with the correct length you preset. It comes in a pair (YES, what you pay for is a pair of the most high-tech and stylish crutch in the market). Each piece of X-crutch weighs only 2 lbs. It can be collapsed to it’s minimal length and extend to your preset desired length in just a second. The length can be adjusted base on individual’s leg and arm length for the best posture and comfort. Made from high grade aircraft quality aluminium alloy, weighs less than 1kg (2 lbs) and able support user weight up to 125kg each side. It is suitable for user of 4’3″ to 6’1″ and it stows away to 2’5″ length only. It’s unique design and mechanism allows user to go up-and-down the stair case easier with it’s unique shape and proper support against user shoulder. The durable anti-slip rubber foot provides better stability and bigger range of movement during usage. 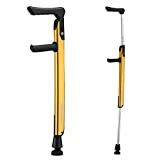 X-Crutch is the most advanced underarm crutch in the world made of high-grade aluminium alloy and it is elected as No.1 crutch of the year due to it’s functionality and durability. It’s unique anti-slip tip and shape allows user to move faster and easier to go up and down the steps. The price showing is for a pair of X-crutch.